Last October, Brushes developer Steve Sprang, and founder of Taptrix Inc. teased the attendees of the iAMDA Mobile Art Con with a creation in the works- a vector program called “Inkpad” which he had slated for release in November of 2010. Much like the “Brushes” app, it had an enticing “touch and go” quality about it, with the ability to easily make paths, add and delete anchor points, create unlimited vector layer and custom gradients, etc. He effortlessly demonstrated a test piece in real time for conference attendees, and the prototype looked like it might be yet another Taptrix success. While the eventual debut was actually four months delayed, It appears that it might have been worth the wait. Early reviews of it are good, in the 4+ range on the iTunes Store, and my own experience of it has been very positive. First of all, don’t expect a high-powered $1.99 version of Adobe Illustrator. It’s not even close, and despite its capabilities, Inkpad is not meant to compete with a professional desktop program (yet). Its tool palette is somewhat sparse, containing only one free drawing tool (a brush icon), which creates shapes. In order to draw a line, one has to use the stroke option with no fill at the smallest line quality. There are no spray paints or texture paints yet. It has a simple oval and rectangle tool, an eyedropper, a pen nib for adding and subtracting anchor points, a selection tool, a direct selection tool, a scaling tool and a rotation tool. The bottom menu allows users to “select all on layer” or “select all” in general, and this is useful for scaling, moving, all or selected elements in the drawing. I was actually surprised with the simple, and limited tool bar, but Sprang pulls off the “less is more” effort and a user can immediately figure it out without plodding through the help menu. I would hope that future updates might eventually add a live paint bucket, custom brushes, an eraser tool, a line segment tool, etc. While it’s possible to turn text into an editable “object”, (it can be scaled, turned flipped, etc), it’s not possible to fill text with a custom gradient, or to convert it to outlines in order to make bezier curves and alter the text object’s shape- a staple of text editing in vector programs. Perhaps this omission will also be addressed in a future update. Despite these limitations, the app is remarkably versatile, intuitive and can easily provide an artist with a sketch on the go that can be outputted as an .svg file directly to your Dropbox, or emailed as a .png, .svg, .jpg, or .pdf. 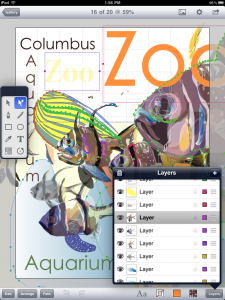 The ability to export as an .svg is a valuable feature, as it can be edited in Adobe Illustrator (with all paths intact. It might not be the software of choice as a complete “studio” software in its own right, but it certainly can be your “subway commute software,” and that presents a remarkable opportunity for artists and designers to work on the fly and produce a more than adequate start to a legitimate design. The serviceable sketch that this app can produce serves as more than just a base for a finished, publishable product. In fact, a skilled designer could easily produce a finished piece with it from start to finish. What the app lacks in extras, it makes up for in the intuitive interface. Sprang has a good sense of programming from the point of view of the user, and not from the mind of the developer’s “in-language.” This kind of ready-to-use quality is what can make or break an app in a few cursory tries, and it can make the difference between becoming a “go-to” app, and one that never gets used again. Inkpad’s drawing brush, layer menus, toolbars, intuitive tapping and pinching reactions, etc, almost always do exactly what one would expect them to do, reflecting an intuitive engineering that doesn’t lose a user in the process of artmaking. Simply put, the app WORKS like it should. Some of the other vector apps such as Paintbook 3.2, iDesign and others actually have more capabilities for drawings and versatility for layers, but I find them to be a little less intuitive, or at least having a slightly steeper learning curve. While digital-savvy artists might actually prefer complexity and extended tool options, the layman artist probably will want to be able to jump right in. Like Brushes, Inkpad seems to bridge the amateur-professional divide with a user interface that doesn’t require a training seminar. Brushes users, or those who enjoy pure drawing/painting might not really enjoy, or have a need for Inkpad-nor might professional designers who are already accustomed to a more complex language. But Inkpad produces a product that will be immediately recognizable as the graphic design lexicon of the day. Early artist efforts I’ve seen on the Ikpad Flickr site consist mostly of designs made up of color-fields, stroked with surrounding lines or merely consisting of a conglomeration of hard-edged organic or geometric shapes. This style ironically resurrected or perpetuated the modernist obsession with flattening and fragmentation, while the computer has codified it as a uniquely 21st Century style. I haven’t seen many artists directly incorporating the photograph yet, and this may relate to the absence of erasers or the ability to alter layer opacities. These features, if added might might provide for more subtlety and versatility in the apps end products. Sprang originally announced that the app was to debut at $9.99, which would already be reasonable if it weren’t for the fact that we’ve now become accustomed to anything in the $5.99-$9.99 range as the going price of a “professional iPad app”. Taptrix Inc. has debuted Inkpad at an introductory price of $1.99, which is most certainly an introductory offer. At this price, the app is more than a steal, but even when the cost goes up, I would still advise any interested artist to grab it. Its main strength is its speed and simplicity. It delivers in its ability to draw freeform shapes in unlimited layers, and to do it in “real time” without bogging down in a lot of memory delays. The ease, versatility and simplicity of it is quite remarkable. Sprang has already proven with the Brushes app, that a well-designed app holds the day when it comes to gaining word-of-mouth adoption. I don’t know if Inkpad will rise to the level of popularity of Brushes. The drawing language isn’t for everyone, and the uninitiated, or the causal artist might not be inclined to employ the harder-edged, and more commercial language of graphic design or have the patience to draw solid fields exclusively via bezier paths (as opposed to traditional brushwork). For that reason, it might be confined to a more limited crowd than a drawing/painting app. But certainly, with this app, and other vector apps, the challenge will be to court high school and university-level art courses, as there is a real need for vector apps that don’t require many tutorials. An app like Inkpad might be just such a solution for mass-usage. Time will tell if Inkpad” enters the vernacular as a default term for iPad vector graphics in much the same way as “Brushes” became synonymous with fingerpainting at its inception, but it’s a solid debut, and further evidences that mobile art is well on its way to the popular mainstream of art and design. John Bavaro is an artist and an Associate Professor of Art at Edinboro University of Pennsylvania. This entry was posted on Wednesday, March 9th, 2011 at 00:41. You can follow any responses to this entry through the RSS 2.0 feed. You can leave a response, or trackback from your own site. Great take on Inkpad John. I can’t disagree with any of it. I’m a huge fan of Paintbook 3.2 as well. It was an app that I first started to use around MobileArtCon 2010. I worked in Paintbook all weekend. By the end, I was amazed at how it just worked for me. If you’re willing to put in a bit of extra effort to understand Paintbook it’s worth it. Especially for the type of drawing you have been doing with Inkpad. It’s really perfect for that. I’m really glad to have both apps. Both are completely different animals. Inkpad is fast, simple and powerful. 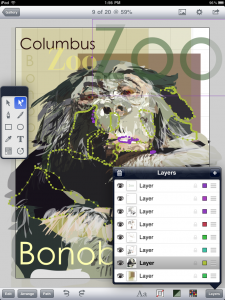 Paintbook is fast, sort of complicated and powerful. Good tools is all. I look forward to more of your Inkpad paintings. Great review, John! I agree with everything you say! I, too have used and loved Paintbook from the start and while it has grown in marvelous features and gives a smoother, non bezier line, it can be complicated to use. The bezier tool has always been a mystery to me and presently, I can not imagine doing a whole drawin with it, but if anyone can simplify it for me, it will be Steve. So far, the gradients in Inkpad are really fun and easy. I am hoping the brush will become a bit smoother in the future. If so, Inkpad will become as joyful as Brushes to use and I will be absolutely delirious! @Mary The freehand brush tool smoothing has already been submitted to Apple and should be available in the next update. I haven’t used the updated tool yet, but that is straight from Steve Sprang. There are also a few new features. My guess is the update will hit any day now. @Chris…..yeah…I didn’t want to disparage any app in this review, especially Paintbook. I plan to get more acquainted with that too……just a matter or trying to not be a jack-of-all-trades for me at this point. @John – I don’t think you disparaged Paintbook in any way. And your assessment of Inkpad is certainly great. Like you say, there is a reason Brushes is a great app. And Inkpad will be. Those apps are so easy to use. I love being able to just jump into one. I like that we have different apps to choose from. Competition among developers benefits users. Having a place to go (like Fingerpainted.it) that reviews apps for artists, by artists is so valuable. Thanks again, and I’m looking forward to more of your paintings. I think you are really pushing the boundaries of what Inkpad was intended to do. And that’s a good thing! Excellent write up John. Thanks so much. I too am enjoying the app. I haven’t done as much vector illustration in the past, so I look forward to trying some new things. Once again I am very impressed with Steve’s work. Great review John, you covered it and I totally agree with you! A great app, super price, grab it now. Great review, great thread here. Thanks John! Where do you find the export options? I only get a .png file when I email it. John, thanks for the thoughtful review. Pmcm, email me at support@taptrix.com and I’ll help you with your SVG problem. I read your article in the newspaper about the education cut. I thought it was really well written. You hit on really important points. Thank you for the article!